Cashew nuts may taste decadent, but they're actually good for your health. Rich in important nutrients such as protein, fiber and iron, cashews are a snack you can eat every day without guilt. That said, eating large amounts of cashews can easily lead to weight gain, so stick with just one serving for your waistline's sake. 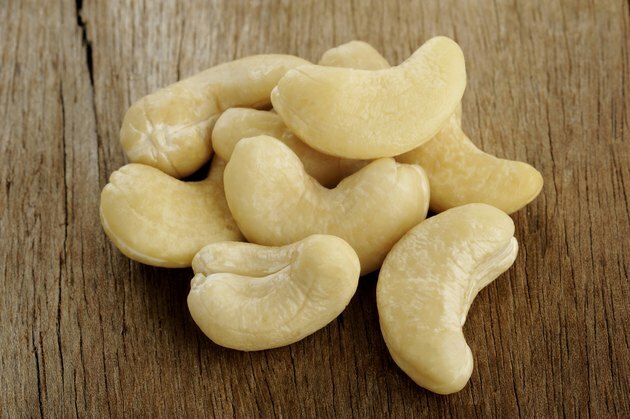 Cashews are rich in heart-healthy monounsaturated fat. But even nutritious fats contain more than double the calories of carbohydrates or protein, so cashews pack a hefty caloric punch. Just 1 ounce of dry-roasted cashews contains 163 calories; eat 1 cup -- easy to do when snacking straight from the bag -- and you'll have consumed 786 calories, nearly 40 percent of what you need in a 2,000-calorie diet. When you eat more calories than your body needs for energy, it stores the excess as body fat, and you gain weight. Although plain cashews contain very little sodium, salted versions may contain about 181 milligrams of sodium per ounce. Excess sodium may increase your blood pressure, possibly raising your risk of cardiovascular disease. The Centers for Disease Control and Prevention recommends that healthy people get no more than 2,300 milligrams of sodium per day, while those at risk of heart disease should get no more than 1,500 milligrams of sodium per day. While cashews' sodium content may seem relatively low compared to these numbers, sodium adds up quickly with multiple servings -- and if you're like most Americans, you're already getting too much sodium in your diet. Choose unsalted cashews to avoid this issue. You're unlikely to find raw or in-shell cashews at the store, but if you do, steer clear. Cashews are related to poison ivy and poison sumac, and oils in their shells cause an itchy, unpleasant reaction on your skin. Roasting the de-shelled cashews at high temperatures destroys any lingering toxic oils, which is why you're perfectly safe eating commercially prepared cashews. Your body needs a broad range of nutrients to thrive, and eating too many cashews will leave little room for other important foods. The U.S. Department of Agriculture's MyPlate guidelines recommend eating just 5.5 ounces of high-protein foods -- including nuts, beans, tofu and fish -- each day, and you'll be healthiest choosing a variety of items from this group. You also need plenty of fruits, vegetable and grains, so don't let cashews or any other food dominate your diet. Which Nuts & Seeds to Buy Organic? Can You Get Cyanide Poisoning from Eating Almonds?